Retail Launch of Hello Kitty Online! What’s more, you can now buy and spend Sanrio Cash Points! Visit the HKO web site and click on Shop to get started! You’ll be able to pick up many exciting things at the game’s item mall. $15 in Sanrio Cash Points, which can be used to buy premium items in the Item Mall! Choice of one of four exclusive and adorable pets! Pick a loyal friend to accompany you on your adventures! Full-color 82-paged Hello Kitty Online manual! Hello Kitty Online collector’s postcards. The Hello Kitty Online Premium Edition is available now at retailers across U.S. and Canada for $19.99, and will be coming soon to Europe! Hello Kitty Online game cards will launch at key retailers beginning in a few weeks’ time. Read the retail launch press release here. From August 24 to September 24, 2010, SanrioTown is boosting the Sanrio Loyalty Points (SLP) multiplier to 5x! This means that during this period you will get five times the normal amount of Loyalty Points each time you use SanrioTown’s free services, which includes blogging, uploading videos, and playing games. To see the full list of services that earn you Loyalty Points, visit this page. Attention Hello Kitty fans: Welcome Back Week starts today! Get ready for new features, freebies and loads of fun! This is the best time to return to HKO if you have been gone for a while. Come back to the game, see what’s new and what’s coming soon, and join other players as they venture forth into the magical world of Hello Kitty Online! Welcome Back Week runs from August 20, 2010. Read on to learn how you can benefit! From August 20 to August 26, 2010 (EST), log in to Hello Kitty Online at least once a day for four days and you will receive a Gold Sunbright Express Ticket! The ticket lets you travel to any Sunbright Express station (unlimited use for 12 days). Now you can get this valuable cash point item worth 165 cash points for free! Just make sure you log in once a day for at least four days during Welcome Back Week! Item Mall and Sanrio Cash Points! Starting August 24, 2010, players can purchase Sanrio Cash Points (SCP) and start shopping for the hottest items in the HKO Item Mall! You’ll be able to buy Sanrio Cash Points online directly from the Hello Kitty Online web site. To learn more please go to http://www.hellokittyonline.com/shop/payments. From August 24 to September 24, 2010, SanrioTown is boosting the Sanrio Loyalty Points (SLP) multiplier to 5x! This means that during this period you will get five times the normal amount of Loyalty Points each time you use the SanrioTown’s free services, which includes blogging, uploading videos, and playing games. To see the full list of services that earn you Loyalty Points, visit this page. Login to the game now to enjoy Welcome Back Week! If you haven’t downloaded the game yet, click here to get our new lightweight 143 MB playable installer, which lets you get started with the game while it downloads in the background. If you have comments or questions, please email us at onlinegame@hellokitty.com! See you in the game! Players from the US & Canada and International servers will soon be able to purchase Sanrio Cash Points via Playspan’s payment portal. These Sanrio Cash Points can be used to purchase cute and cool virtual items from Hello Kitty Online’s item mall. Playspan is an industry leader in monetization solutions for more than 1000 online games, virtual worlds and social networks. We’ll be announcing more updates on this real soon so stick around! In the meantime, read-up on the coverage from TechCrunch. 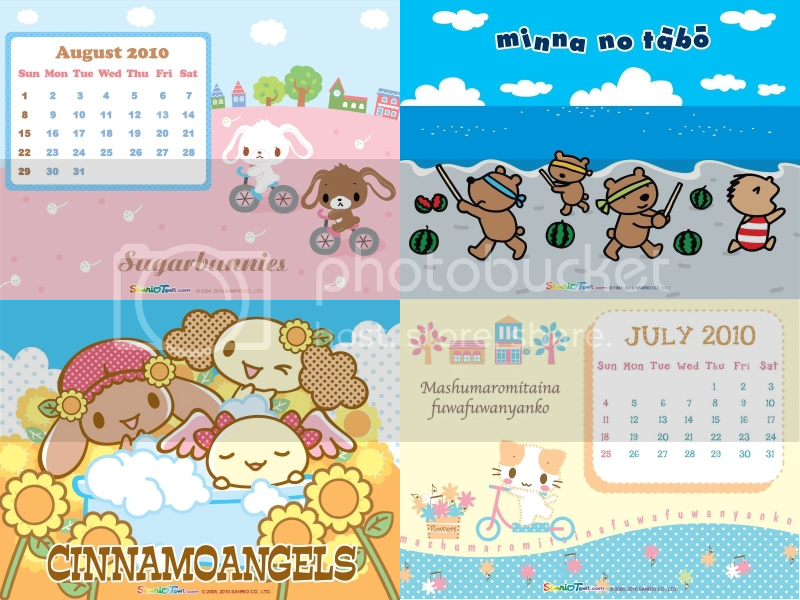 The new SanrioTown freebies are now available for you to download! All you need to do is sign in and go to the Download Center to grab the lovely wallpapers, calendars and more! Get them all now! You are currently browsing the Kitty News Blog weblog archives for August, 2010.